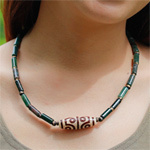 An elegant unisex necklace in a design from Bangkok's gemstones jewelry artisans. The master artisans thread DZI Tibet (agate), moss agate, blood stone and brass beads by hand on metallic wire. The necklace fastens with a silver lobster claw clasp. Materials: DZI Tibet (agate), moss agate, blood stone, brass and sterling (.925) silver.